Your dedication to raising money for making life better for children with cancer as part of the ASK 5K & Fun Walk is incredible. We know that raising even $500 can seem daunting, so we put together a quick list to make everything slightly more manageable and fun. You’ll find below a breakdown of a 10-day fundraising strategy that you can use to raise your first $500 (or maybe your next!) as you work towards your goal. Check out your High Five award badge on your fundraising page. You deserved it! Celebrate reaching your $500 goal by posting an update on your team page. Telling your personal story on your page is so important to engaging your family and friends to help you raise money. Upload a great photo to make your page look amazing. You can customize everything quickly and easily. You should do this before you share your page with your family and friends. 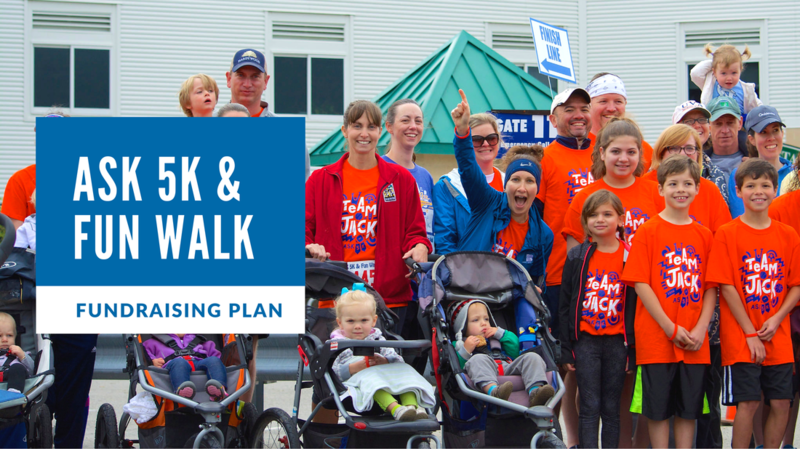 Send the link to your 12th Annual ASK 5k & Fun Walk team page to your family and friends, and ask them to JOIN or DONATE. If they join the team, they will also have their own fundraising page that will support the team’s overall goal. Remind them to also customize their page and tell their story. Updating your supporters is key to raising more money and meeting your goal -- and perhaps winning a spot in a Top Team VIP Tent or award for Highest Fundraising Individual. Fancy schmancy!